MWC 2016 is upon us, and Huawei has officially unveiled its latest product: the Huawei MateBook. Not only is this the company’s first-ever Windows 10 tablet, it is also a very well-equipped machine that go right up against popular tablets such as Microsoft’s Surface Pro 4 and the Apple iPad Pro. Huawei’s first shot at a Windows 10 tablet is quite an impressive one; the MateBook is packed with some really respectable specifications. These include a 12-inch 2160 x 1440 IPS display, which has a brightness of up to 400 nits. Other than that, Huawei is also very proud of the MateBook’s screen-to-body ratio of 84%; a higher ratio than both the Surface Pro 4 and iPad Pro’s displays. Not surprisingly, powering the MateBook is Intel’s latest Skylake-based Core m processors. According to Huawei, the MateBook can be equipped with a Core m3, m5 or m7 processor, which has a clock speed of up to 3.1GHz. Other than that, this Windows 10 tablet is packed with a 4,430mAh battery that will supposedly deliver up to 10 hours of usage. This is especially impressive considering the fact that the MateBook is only 6.9mm thick and weighs a mere 640 grams. And then we have one of the main highlights of the MateBook: its stylus, which is dubbed the MatePen. Featuring as many as 2,048 levels of pressure, Huawei mentioned that the stylus is more than ideal for drawing. Interestingly, the MatePen also has a laser pointer and “presentation clicker” for presentation purposes. As for battery life, the MatePen can last for up to a month with only one hour of charging. Of course, the MateBook would not be a competitor to the Surface Pro 4 and iPad Pro without a good keyboard. Judging by the appearance of the keyboard, it seems to have a standard layout, which is always a good thing. In fact, it bears quite a striking resemblance to the Surface Pro 4’s keyboard, although its overall design is more similar to the iPad Pro’s equivalent. Regardless, the keyboard is said to be spill-resistant and features a curved key design for ergonomic purposes. Rounding out the specifications of the MateBook are up to 512GB of SSD storage and 8GB of RAM, a front-facing camera, a USB Type-C port, a side fingerprint sensor (which Huawei claims is a world’s first), as well as a set of stereo speakers with Dolby noise reduction. There is also an accessory for the MateBook dubbed the MateDock, which adds even more ports to the tablet. 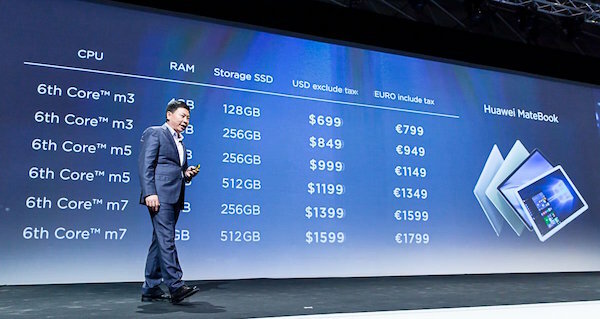 As for retail price, the Huawei MateBook will go from US$699 (about RM2,940) to US$1,599 (approximately RM6,730), depending on the hardware. As usual, the local availability of the MateBook has not been revealed yet, but hopefully, this sleek-looking Windows 10 tablet will arrive on our shores not too long from now with a competitive price tag.